Posted by Grace on April 24, 2013; This entry is filed under Natural Grace Therapies. Summer is my favourite season, it’s nice meeting up with friends for a picnic or seating outside a cafe. You may open the doors and windows in your house to help keep your rooms cool. A natural part of the summer months is the emergence of insects such as bees, wasps and mosquitoes. You may be unlucky and get bitten or stung by one of them. There are a number of essential oils that can be used if this should happen. Of course prevention is better than cure. Lemongrass and Citronella can keep insects at bay using airborne methods such as putting a few drops with water in an oil burner. Also putting a few drops into a cup of hot water and strategically placing them by windows where insects might enter the room. If you have a plant spray bottle you can spray lemongrass or citronella diluted in water around the room, make sure you use the bottle for using essential oils only. To prevent insects landing on your skin and biting you, lavender is a good oil to massage onto your body. You can add a few drops to a vegetable oil or to your normal body moisturiser. Making sure that you apply the oil to the exposed areas of your body including your face. Ankles are a prime target for mosquitoes so covering your feet with cotton socks is a simple and effective measure. You can also put a drop of neat lavender oil at the top of each sock. If you are wearing trousers you can also place a drop of lavender onto the bottom of your trouser leg. Essential oils can come to the rescue if you are unfortunate enough to be bitten or stung by an insect. Below are some examples of how to deal with specific bites or stings. Bee Stings: If you are allergic to bee stings I would hope that you were carrying your adrenaline pen with you at all times. If you have an allergic reaction please seek medical attention immediately. When you’ve identified where the sting is, look for a small, dark object which resembles a splinter. You might even see a sac on the outer part of the stinger. If you do, then cut that part off first so that it cannot release any more poison before pulling the stinger out with tweezers if you have them to hand. Don’t attempt to pull the stinger out by the sac as this will just release more poison into the bloodstream. When you’ve removed the sting, apply a cold compress of camomile to the area. Try to leave it for several hours or if in an awkward place hold the compress for as long as possible. Apply a drop of neat camomile to the area three times a day for two days. Wasp stings: Being alkaline, it helps if wasp stings are treated with cider or wine vinegar. Into 1 teaspoon of this put 2 drops each of lavender and camomile essential oil, mix well and dab on to the bitten area three times a day. Mosquitoes: Use neat lavender oil directly on the bite. If you’ve been bitten over a large area, then make up the following solution for a bath. To 1 cup of cider vinegar or the juice of 2 lemons add 10 drops of lavender and 5 drops of thyme. Add this mixture to a bath of water and lie in it. Rinse off and then apply neat lavender to all the bites. It is a good idea to keep at least a bottle of lavender essential oil at home and even in your bag when out as this is the most versatile oil for insect bites and stings. 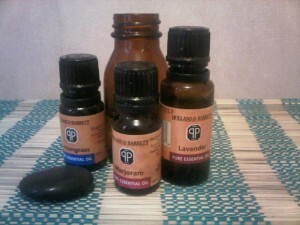 When I travel abroad to hot countries I always take 10ml bottle of Lavender essential oil with me. On the rare occasion that I have been bitten by a mosquito I find that it soothes the area, eases the itching and reduces the swelling. Essential oils can be purchased from health food shops. The information on treating insect bites and stings is not a replacement for advice from a medical professional. Please seek medical advice if your symptoms get worse.